Automated inspection systems or automated test equipment (ATE) can use a wide range of inspection and testing types, including laser inspection, leak tests (pressure decay), flow tests, dimensional checks, and vision systems. 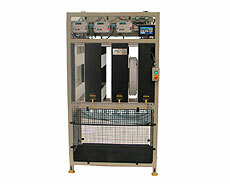 Dial-X Automated Equipment, Inc. can design and build all types of test cells, including stand alone test cells or cells that are part of a larger automated assembly system. With our automated inspection systems or automated test equipment (ATE), all testing is done to the customer's exact specifications. These systems are the best way to verify your products and will eliminate the chance of defective parts reaching your customer. Dial-X Automated Equipment, Inc. has the experience and flexibility to meet your exact inspection system needs. For further information or a free quote on automated inspection systems, contact Dial-X Automated Equipment, Inc.